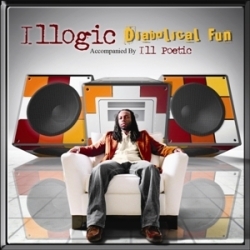 RapReviews.com Feature for March 17, 2009 - Illogic's "Diabolical Fun"
No one has a definitive initiative when touching microphones"
If there is a rapper who has "definitive initiative," it's Illogic. He is a verbal, verbose, and complex rapper, fond of intricate rhymes that can be difficult to digest. His voice sounds similar to Jay-Z, if Jay had spent his youth studying philosophy rather than slanging 'caine. Part of Illogic's appeal is that you can continue to unwind and dicipher his rhymes on the third, fourth, twentieth listen. His flow is rapid-fire, multi-syllabic, and full of wordplay. The flipside of this is that sometimes his rhymes are hard to catch the first time around. Listening to Illogic can also be mentally draining; after twelve tracks you might feel like you just took the GRE, and need some Rick Ross to balance yourself out. I could see the finish line"
He comes off as part OG, part elder stateman, and part dad. Most of the time he is dropping science, but occaisionally he lectures. He's at his best on tracks like "Let's Go" or "Now's the Time," where he is calling out wack MCs by showing them how it's done, and clearly having a blast doing it. He even does a kind of singing chant over an acid jazz beat on "Feel the Beat," complaining that "all we preach is violence/and wonder why we're dying/life is just a party/it's all Patron and Bacardi." Doing a five-minute dance number on a hip hop album is risky, but Illogic pulls it off. While Illogic is still on Blueprint's Weightless Recordings, Blueprint stays away from the boards. Instead Ill Poetic produces all twelve tracks, and offers his mic skills on "Crash." Ill Poetic has made a name for himself doing hip hop remixes of artists like Portishead and Nine Inch Nails, so it's no surprise that "Diabolical Fun" has a harder edge and wider range than the average hip hop album. A lot of the beats on the album draw from soul, including the bouncing "Now's the Time" and "I Know You," which is one of the best tracks on the album. He also offers up more electronic beats, like the futuristic title track. In general the beats sound brighter, louder, and more uptempo than most of the indie hip hop I hear. The downside of this is that the music sometimes threatens to overpower Illogic's rapping, and the combination of the dynamic beats with Illogic's dynamic flow can lead to sensory overload. "Diabolical Fun" is definitely not subtle or understated. The beats and rhymes come at you in hi-def with surround sound. Illogic sounds hungry and energized, and Ill Poetic is intent on getting listeners off of their asses. That makes for an exhilarating if at times exhausting listen. Both the producer and MC could have toned it down a notch, but it is still worth copping.